The goal of the study was to seek physiological correlates of lucid dreaming. Lucid dreaming is a dissociated state with aspects of waking and dreaming combined in a way so as to suggest a specific alteration in brain physiology for which we now present preliminary but intriguing evidence. 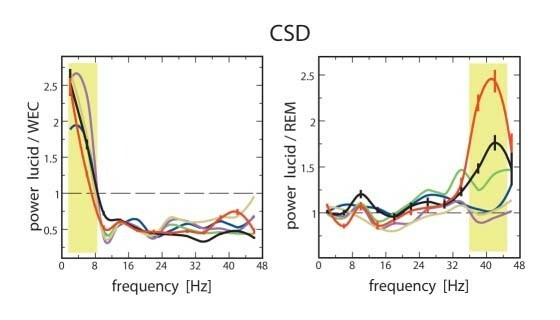 We show that the unusual combination of hallucinatory dream activity and wake-like reflective awareness and agentive control experienced in lucid dreams is paralleled by significant changes in electrophysiology.